Its practice of resolving disputes primarily favours personalised handling of complainants in order to optimise the success rate. In volume terms, most of the Mediator's work consists in disputes involving domestic customers in the field of energy supply: gas, electricity and related services. The Mediator, Jean-Pierre Hervé, has been registered since 25 February 2016, by the CECMC (Commission for Evaluation and Control of Consumer Mediation), in accordance with the provisions of the French Consumer Code (articles L 611-1 to L 641-1, and article R 612-1 to R 616-2), on the list of consumption mediators, and as such, notified to the European Commission. Not be in a conflict of interest but, if so, to report it. 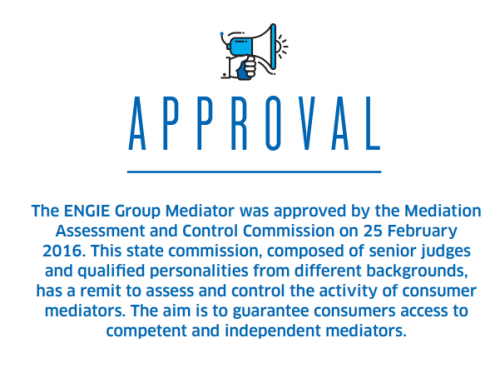 Beyond the mediation process put in place, in accordance with the regulatory provisions, the ENGIE Group’s Mediator offers specific and personalised handling, at the service of the parties involved in the dispute. Recourse to the ENGIE Group’s Mediator is free of charge. The customers may be individuals, companies, local authorities, institutions, public departments, landlords and co-owner associations, etc. 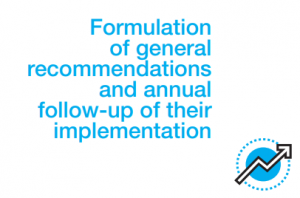 Since his appointment in July 2014, the Mediator has defined a development plan for recourse to the amicable resolution of disputes, within all subsidiaries and divisions, in France, Europe and worldwide, for the ENGIE Group, present in 70 countries.